Jason Hartman and economist and best-selling author, John Lott, discuss Lott’s book, “Freedomnomics: Why the Free Market Works and Other Half-Baked Theories Don’t.” Listen at www.HolisticSurvival.com/radioshows. In his book, Lott answers many common economic questions, such as are free market economies really based on fleecing the consumer, and is everyone, from corporate CEOs to your local car salesman, really looking to make a buck at your expense. He bravely confronts the profound distrust of the market. Lott shows how free markets liberate the best, most creative, and most generous aspects of our society, while efforts to constrain economic liberty, no matter how well intentioned, invariably lead to increased poverty and injustice. John R. Lott, Jr. has held positions at the University of Chicago, Yale University, Stanford, UCLA, Wharton, and Rice and was the chief economist at the United States Sentencing Commission during 1988 and 1989. Lott has published over 90 articles in academic journals. He is also the author of The Bias Against Guns, More Guns, Less Crime: Understanding Crime and Gun Control Laws, and Are Predatory Commitments Credible? : Who Should the Courts Believe? The third edition of More Guns, Less Crime will be published by the University of Chicago Press this April. Opinion pieces by Lott have appeared in such places as The Wall Street Journal, The New York Times, The Los Angeles Times, USA Today, and The Chicago Tribune. He has appeared on such television programs as the ABC and NBC national evening news broadcasts, The “NewsHour with Jim Lehrer,” and the “Today Show.” He received his Ph.D. in economics from UCLA in 1984. Narrator: Welcome to the Holistic Survival Show with Jason Hartman. The economic storm brewing around the world is set to spill into all aspects of our lives. Are you prepared? Where are you going to turn for the critical life skills necessary to survive and prosper? 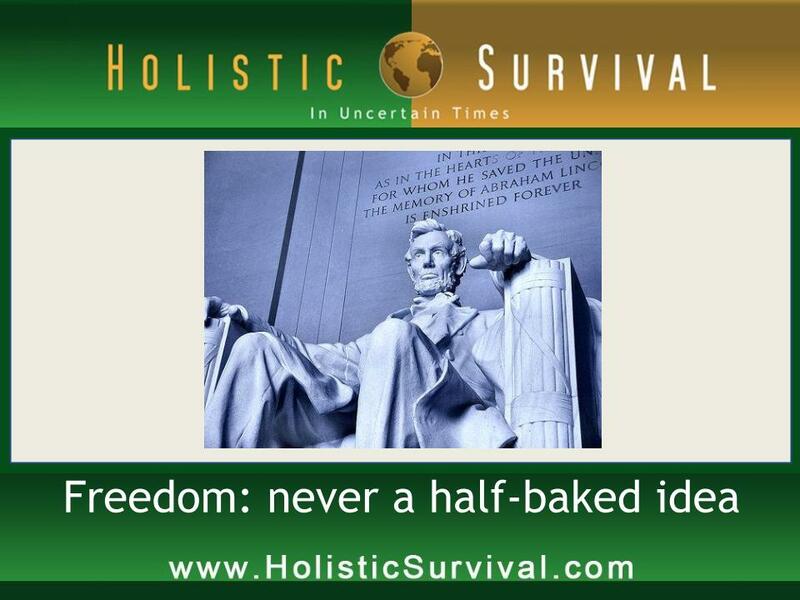 The Holistic Survival Show is your family’s insurance for a better life. Jason will teach you to think independently, to understand threats and how to create the ultimate action plan. Sudden change or worst case scenario, you’ll be ready. Welcome to Holistic Survival, your key resource for protecting the people, places and profits you care about in uncertain times. Ladies and gentlemen, your host Jason Hartman. Jason Hartman: Welcome to the Holistic Survival Show. This is your host Jason Hartman where we talk about protecting the people, places and profits you care about in these uncertain times. We have a great interview for you today and we will be back with that in less than 60 seconds on the Holistic Survival Show. 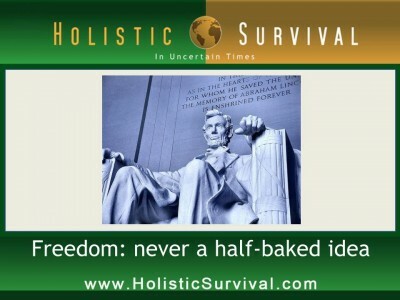 And, by the way, be sure to visit our website at HolisticSurvival.com. You can subscribe to our blog which is totally free, has loads of great information, and there’s just a lot of good content for you on the site. So make sure you take advantage of that at HolisticSurvival.com. We’ll be right back. Narrator: Now’s your opportunity to get the Financial Freedom Report. The Financial Freedom Report provides financial self-defense at uncertain times and it’s your source for innovative forward thinking investment property strategies and advice. Get your newsletter subscription today. You get a digital download and even more. Go to JasonHartman.com to get yours today. Jason Hartman: It’s my pleasure to welcome John R. Lott to the show. He is the author of several books, one of them Freedomnomics: Why the free market works and other half-baked theories don’t. And we had John recently on my Holistic Survival show and we were talking about more guns, less crime. And it’s a pleasure to have you back, John, to talk about free market economics. How are you? John R. Lott: Great. Thanks for having me back on. Jason Hartman: So, nowadays, more than ever, with all this ridiculous government spending, the stimulus after stimulus after stimulus, I’ll ask you about the book too but maybe we’ll start with some current events. And you apparently think that the stimulus actually increased unemployment? Now, a lot of people would say that the stimulus didn’t do enough or it cost an average of $300,000 for every $40,000 job it created massively inefficient as with everything government, but do you think it increased unemployment? Tell me about that. John R. Lott: Right. Well, the government spending doesn’t create new spending. What it does is it moves money from where you and I would have spent it to where the government thinks it should be spent. So there’s firms and businesses that would have gotten our business, but now the government’s decided some other firms or some other government agency should be getting money. The problem is that as you move that trillion dollars or so around in the economy, you’re going to be moving around the money, the jobs that are associated with that money. When certain firms are businesses aren’t going to be getting the spending that they would have gotten previously, they’re not gonna have the levels of employment that they would have had. Other places are going to get the money and they’re going to try to increase it. But the problem is people don’t instantly move from one job to another. It takes a while for people to find a new job. And that’s where you go and you create unemployment. And people who may be losing jobs in let’s say the oil industry or coal or some other place, just because you have more jobs in solar energy, there may not be perfect jobs for them. People who were in those jobs that they had to begin with, those people bear skills. There may not be some immediately similar job and they might have to take a big drop in pay. It may be hard for them to accept that. And when you also combine that with these huge long unemployment insurance benefits, it essentially says to people “Look, it’s hard for them to accept the reduction in jobs because of the change in where the money’s going” and they’ll put it off as long as possible with the hope that maybe the type of job that they had previously will come back. Right now we have unemployment insurance benefits that go up to 99 weeks. If you look at unemployment insurance from the end of World War II up until June of 2008, you had a range of benefits from 22 weeks up to almost 30 weeks. So we’re like more than 3 times what the maximum benefits have been before. It’s one reason why I also think people are taking longer to go and look for jobs than they have in the past. Jason Hartman: You’re saying they’re taking longer because there’s a disincentive because of the government safety net, right? There’s not that much urgency? John R. Lott: Right. There’s not as much as there would be otherwise. The problem is you only get this government money as long as you’re unemployed. You lose those payments as soon as you become employed again. And that’s almost like a tax for you going back to work. And so I’m not saying people like getting 40% or 45% of their previous income. They’re actually getting more than that when you include things like the unemployment or the health insurance subsidies that they get and the mortgage payment subsidies they can get. Jason Hartman: Maybe food stamps and maybe a bunch of other things, yeah. John R. Lott: All those things can mean that they can get maybe 2/3 of the income that they were previously getting. So they only get that, though, as long as they’re unemployed. Now one option you could think if somebody wanted to go and help them is you could just give them a lump sum payment rather than making it so that they get so much per each week that they stay unemployed you can give it to them all at once. But I think most people would understand if I gave you a lump sum all at once, then a lot of people would just become unemployed just so they could get that and then they go back to work again. But you still had that effect to some extent because they know if they become unemployed they can get these benefits. I’ll give you one example. If you look over the last two months, there have been huge swings in new claims for unemployment insurance. About a month ago, they fell to a two year loan. People were talking about, geez, it looks like the job market’s improving. And then all of a sudden in the last few weeks it soared again back to record levels. Well, what changed in the last month? What happened was, as you may remember, about a month ago the unemployment insurance extension had lapsed. If you filed for unemployment insurance at that time, you would only get 26 weeks. So there were high claims. As soon as the long term benefits lapsed or you could no longer get up to 99 weeks as backed down to 26, there was about 100,000 drop in the number of new filings for unemployment insurance, and then as soon as the benefits went up again a lot more people file. Now, the important thing here is that it’s not just people who are already unemployed who are deciding to stay unemployed longer. These are people who are making a decision do they enter the ranks of the unemployed? And you had fewer people willing to do that when the benefits were cut. Jason Hartman: Yeah. Well it’s just that old thing what gets rewarded gets repeated. I mean that’s so obvious and so frequently expressed. It’s amazing. So in the first chapter of the book, Freedomnomics, you asked the question are you getting ripped off? Are people getting ripped off? John R. Lott: I don’t think so. I mean I think surely there’s fraud that occurs in mistakes, but I think the thing is actually how rare it is. I mean there have been some people, whether it be Michael Moore or others who seem to think that corporations are committing fraud left and right all over the place. Like, you go back a few years when we had Enron and a couple of other big financial scandals, people could point to 4 or 5 companies that were involved in that, but when you think of the fact that we had like 12,000 publicly traded firms, to me the fact isn’t that these horrible things happened, cuz they obviously do from time to time, but how relatively rare they are. And the question to focus on is why you have the huge vast majority of companies not engaging in the fraud that occurs. It’s obviously important to those who are defrauded in the small number of cases where it does occur, but I think there’s a bigger question that one has to ask and that is why it is as rare as it is. Jason Hartman: That’s a pretty good question you pose because I have traveled extensively. And of the 58 countries I visited, many are former communists in Cuba, certainly is still communist. And what’s interesting about that is that if you want to see fraud on a massive scale and if you want to see back door dealings and payoffs, all you have to do is look at any sort of big socialist/communist government or right here in the good old US of A – every time a new government regulation occurs, people find a way to beat the system. And a perfect example that everyone is familiar with to some extent is rent control. When rent control is initiated, whether it be in the socialist republic of Santa Monica, San Francisco, New York, wherever, it instantly creates a black market and a grey market. And people pay each other off to get into rent controlled apartments and they move out and let someone else sit there, let their friends sit there and lease it to preserve the rent controlled deal and all kinds of crazy motivations occur, right? John R. Lott: Right, when you have someone like Charles Rangle having four rent controlled apartments. You essentially induce people to go and break the law. So you have key money, under the table money there. But the consequences of those things is since they can’t charge people the prices that would clear the market, then we go and have other ways to do it. Maybe I go and give the apartment to nice, elderly quiet women who aren’t gonna damage the place as opposed to young kids. They may be discriminated against because why should I take the risk with them that they could do something wrong to the apartment. I could charge them a higher price if it was non-rent controlled. But since I can’t do it, I go and make decisions who’s gonna get the apartment on something other than that? But you also have the fact that the apartments may not be kept up as well as they would have previously. I’m not gonna make sure the refrigerator’s fixed or other things because I lower the quality since I can’t go and raise the price of the product that’s there. And you have shortages. People aren’t going to go and build as many as they were going to before. But you mentioned the fact that the former civil union in communist countries, I mean, it was rampant the fact that people, when they would get products, they wouldn’t work. And what is it that makes it so firm to have an incentive? Again, it’s not perfect, but why do they have the incentive that they do? And the big thing that companies face is if they don’t give you the product that they promised you’re not gonna go and buy products from them in the future. They’re going to get reputations that are going to make it so people aren’t going to go and trust it. If Bayer aspirin sold sugar tablets rather than real aspirin tablets, the price would fall. It would be more like some no brand generic name, Joe Greens. You go to the store, there’s a reason why certain brands can charge higher prices than others because they’re also conveying something to you about the quality of the product that’s going to be there. You don’t have to pay it. If you don’t trust them anymore, you’re not gonna pay it. You look at what happened to Tylenol prices or others when there were scares about contamination that may have been occurring with those products. And those are real losses to those companies and it really catches their attention. Jason Hartman: Yeah, no question about it. That’s really hard to measure. When you look at the rent control issue that we discussed a moment ago, it’s very hard to measure when these grey areas of like because it’s rent controlled, the landlord might not maintain or improve the property as they otherwise would. But you get a bunch of these people in an ivory tower that analyze something without ever seeing it or knowing the market, you get these 3rd party interest that they don’t know about the transaction and they don’t live there. It’s’ hard to measure, isn’t it? John R. Lott: Well, that’s one of the benefits of letting consumers make decisions for themselves because they can judge what they value and what they don’t value. They see the quality right there to make those decisions. There are certain quality issues that may be hard to go and demonstrate to a third party. I go to a store and the food doesn’t taste the way I like it to taste, I know that myself. It may be hard for me to convince a judge or some bureaucrat that the food doesn’t taste the way I expected it to taste. But there are things that we can measure. One of the things that I’ve looked at before is the impact that firms fest when they commit fraud. And we often think of the fines and criminal penalties and civil fines that companies may face when they commit fraud. But it turns out that that’s only a very small portion of the penalty that they really face. The big penalty that firms face is the fact that people won’t buy their products in the future. So when you see a firm accused of fraud, that you can look at the drop in the stock price of the company and you can compare it to the fine, the criminal and civil fines that they end up paying, and it turns out that those penalties only represent about 5% of the drop in the stock price. The rest of the stock price is due to the fact that customers aren’t willing to go and pay the prices for those products that they had in the past. And that’s about 20 fold time bigger penalty that companies face than the ones that the government imposes. Jason Hartman: Now, I think that area gets a little bit murky and here’s why. What you’re probably referring to is fraud or damage to a reputation that is readily obvious to a consumer. So, for example, Pureau Water and they had that Benzene and I think a couple of people died, whatever it is like that where there’s direct damage to a consumer. But I’ve seen a lot of these companies – Ford is a great example but that’s damage to the consumer, I’ll bring that one up in a second – But a lot of these companies will really have regulatory issues or regulatory fraud where they sort of just put into their business plan we’re gonna pay some fines this year but it’s worth it to pay the fines. There may be no real impact, but the government just wants to hold them up and collect money. But the one example where it’s consumer wise and reputation wise is of course the very famous Ford Pinto with the gas tank that blew up and that was just horrific. They just did the match and thought, gosh, we can save a dollar a car and if we have a couple of lawsuits, it’s worth it. I mean that’s scary. John R. Lott: I think they did the math room, as somebody who’s taught in business schools. The thing is what they did on the law side is they only looked at the legal penalties that they faced. They didn’t consider the reputational loss. They just said if we go to court, how many court cases are we gonna have and what’s gonna be the civil penalty that we’re gonna face, punitive damages, other penalties that we’re gonna face? And that’s the calculation that they did. As we’re just saying, that’s just a small portion of the penalties that these firms face. If they had thought about the reputational penalty for the firm, I don’t think they would have made the decision that they did in that case. Jason Hartman: Yeah, yeah. The reputational penalty, I mean think about it. What was that Pinto thing? 30-40 years ago and I’m bringing it up now. John R. Lott: It sticks with you, but it also tells you how relatively rare those types of things are. But I’m not saying that firms don’t make mistakes from time to time in terms of trying to figure out what products they should make or not. But the thing that’s interesting to me again is how relatively rare those mistakes are, especially if you compare it to the type of soviet union or communist or government run systems that you were talking about. Jason Hartman: Those systems are polluted with disgusting backdoor dealings and fraud everywhere you look. Your book, in many ways, seems to be a response to Freakonomics. And when you talk about reputations, one of the famous examples in Freakonomics is about the real estate agents not really serving the client because they want to turn deals quickly. Can you address that one, what was addressed in Freakonomics and what your response is to that? John R. Lott: Sure. I mean my book does deal with some of the things in Freakonomics. It’s more kind of a run through of the research that I’ve done in my life over the last 25 years of being academic. But one of the comparisons that Freakonomics makes is that they say that real estate agents are like Klu Klux Klan people where they prey on the fear of customers in this case, scare them into taking deals that really aren’t in the customer’s interest, making it so that they sell the house quickly and at a lower price than they would have been wise to sell it otherwise. And one of the pieces of evidence that they bring up is some research that they had done that they really don’t explain in the book is they had looked at housing prices in one city and they claimed to find that realtors, when they sold their own house, got about $3000 more for the house than when they sold a house for a client who is hiring them to sell it. And they took that as evidence of a type of fraud that was occurring by the real estate agents. And the point was if you get a 6% commission on that, you only get a tiny portion of increase in the value of the house, and so that’s the reason why they want to sell it quickly. And I would argue you have to look at what realtors get paid is more than just the commission. They get paid in terms of whether or not you come back to them to try to sell your house when you decide to move. Those things matter a lot to realtors. It’s much more than the 6%. And if somebody feels, finds out later that they could have sold their house for more, feels that you try to put pressure on them in order to try to sell it quickly so that the realtor could just move onto the next house, that’s going to make them reluctant to go and trust you. Just like these companies have reputation, realtors have reputation. And they have to care about whether or not people think that they did a good job or not. It’s more than just the 6% that they get right now. And, to me, when you’re talking about on average the houses that were going for about $300,000 in their sample, $3,000 doesn’t sound like a big difference because these are realtors who every day of their lives they’re looking at houses. They see good deals. It’s not just you or me who may be looking around for buying a house, we look for a couple of weeks and we buy a house. These guys may be looking for years before they find a house that they think is a great deal and then they go and buy it themselves. It’s kind of like well they’re a doctor. You imagine he might be better at figuring out what disease he has or knowing what questions to ask or knowing what doctors might be the best ones, I’m not gonna be surprised if a doctor ends up getting better quality health care than I do because he’s gone to medical school for a lot of years. I’d be surprised if he didn’t. Jason Hartman: When you bring this up, John, it’s kind of like everybody has a long impression that’s been around forever is that if a police officer is off duty and they’re going a little fast and they happen to get pulled over by another police officer, are they gonna get a speeding ticket? Probably not. John R. Lott: There’s benefits from being in the job. Jason Hartman: Every profession has benefits. John R. Lott: A doctor may get better health care but he’s not gonna be as good at buying and selling houses as a realtor is. But it’s not like they’re getting some unusual profits from doing it. They’re just getting a return to spending 8 years in school. You or I could spend 8 years in school and also be better at diagnosing our medical conditions too if we wanted to do that. But it’s very costly, takes 8 years, to go and do that. And so it’s not like they’re getting some unfair advantage. They’re just getting a normal return to the efforts that they put in there. And I think claims about virtually all firms going and committing crimes all the time, kind of analogous to the realtors or broader claims they make, I don’t know how you can judge something like that. I’m sure there are lots of crimes that aren’t reported that we never find out about, but the only way you can make the types of claims that are made in the Freakonomics book is if somehow they had a good measure for how many crimes are there and I don’t find evidence of that. I think people generally, if they’re defrauded, have a fairly good incentive to go and report that their defrauded, financial fraud for sure. You have billions of dollars that could be at stake for any large firm and people have a strong financial incentive, institutions do, to try to figure out when those types of things take place. Jason Hartman: One of the other areas I think that has to be considered is when you look at the massive, massive volume of commerce that occurs in a country the size of the United States for example, there’s more commerce here than probably anywhere in the world – maybe China’s after us. But you should really look at this on almost like a per capita basis. When you evaluate other statistics, you look at crime per capita. You look at income per household or per capita. And that’s the way this should be evaluated. I mean, as a consumer, I hardly ever feel like I get ripped off. I mean it happens occasionally, but if I’m dealing with a business and it’s a retail product, a store, they all take stuff back if I don’t like the product, if the product’s defective. I find, by and large, it’s sort of surprising how well companies stand behind their good name. Jason Hartman: Or, nowadays, you’ve got more power than ever. They don’t want to have it showing up in a social networking site like Yelp, Facebook, Twitter, etcetera, right? Jason Hartman: Yeah, no question. Why is it, John, after all of this, it has just been proven over and over that government doesn’t work? I’m just gonna say it. Why is it that we still have these people who think of government as some sort of nirvana, that it’s like this savior and it’s gonna solve all of our problems? And there’s no example in history. Every example in history shows clearly that when government becomes larger, it becomes, by nature, more oppressive and more invasive and more burdensome on its citizens. John R. Lott: Well, I think part of it is the fact that the economy seems to have complicated that you almost think you have to have some central bureaucrat planning everything that’s there. It’s the only way to make sense of what’s going on. And, in fact, the opposite’s true. The very fact that the economy’s so complicated, you have so many prices that you have tens of hundreds of millions of customers out there who have their own demands an they’re the only ones that really know what they want in different products, it makes it impossible really for any central organization to really know all the incentives or all the different tradeoffs that are there. The miracle thing about the economy is that people get a profit for figuring out what others want and figuring it out quickly. During the health care debate, President Obama many times would talk about profits and how private companies couldn’t compete with non-profits, he would claim, because they had these clauses, and then they had to add profits over on top of it and that customers were paying for these additional profits. Couldn’t be further from the truth. There’s a reason why we don’t have computers and cars and airplanes and everything else run by non-profit companies. It’s not that these profits put the profit companies that at an advantage. What it does is it creates and incentive for them to figure out what their customers want, produce a better quality product and do it at a lower cost. The cost of profit companies are actually lower than non-profits. And the reason why they’re lower, it’s the fact that they can make those profits causes them to concentrate their efforts and work much harder to figure out how to reduce the cost than you would have for the non-profits that are there. The non-profits, despite getting huge tax subsidies from the government, aren’t controlling any industries. And the reason why they’re not is because they can’t compete with the four profit companies that have these bigger incentives to go and give the customers what they want at a lower price. Female: Well, you’re probably not far off from the truth, Rich. Jason actually has a 6 book set on creating wealth that comes with over 100 hours of the most comprehensive ideas on investing in business. They’re in high quality digital download audio format, ready for your car, iPod or wherever you want to learn. Male: Yes. And, by the way, he’s recently added another book to the series that shows you investing the way it should be. This is a world where anything less than a 26% annual return is disappointing. Male we can pick local markets that are untouched by the economic downturn, exploit packaged commodities investing, and achieve exceptional returns safely and securely. Male: He’s recorded interviews with Harry Dent, Peter Schiff, Robert Kiyosaki, Pat Buchanan, Catherine Austin Fitts, Dr. Dennis Waitley, T Harv Eker and so many others who are experts on the economy, on real estate, and on creating wealth. Female: And the entire set of advance strategies for wealth creation is being offered with a savings of $385. Male: Now, to get your Creating Wealth Encyclopedia Series, complete with over 100 hours of audio and 6 books, go to JasonHartman.com/store. Jason Hartman: When the attitude inside of government and the attitude inside of many not-for-profit companies, I can sum it up I think, is: When it’s everybody’s money, the attitude is it’s nobody’s money. And they just don’t care. Nobody cares as much as the shopkeeper. And this was illustrated to me so clearly on a visit to Prague in the early 90s, shortly after, just a couple of years after the Berlin Wall had fallen and communism was basically over for most of the world fortunately, and I remember I was out to dinner with this young girl there, she was probably 21 years old, and I was talking to her and I just said “How could you tell when it was switching over and there was some private ownership and still some state owned stores,” I said “How could you tell which stores were which?” And just so innocently but it’s so obvious, she said “Well, you just knew because when the store was privately owned, the person cared. John R. Lott: Right. It makes a big difference there when you have your own money at stake. And Milton Freedman had a statement similar to yours. He said you just don’t spend other people’s money as carefully as you spend your own. When somebody else is paying for it, you do all sorts of strange things. Look at the way Air Bus is run. Despite getting the government subsidies there, they have huge inefficiencies. You have part of the company owned by England, part owned by the Spanish governments, part by the French government, part by the German government. So what did they do? When they built the new super jumbo liner that they have, jobs have to be apportioned in the different countries based upon the share ownership that the different companies have. So these huge, giant wings for the airplane are built in England. Fuselage is built in Germany. The tail section’s built in Spain and everything’s put together in France. You have to have the huge wings brought down along the rivers in England. And when they get to a bridge, they have to cart the wing, take it off the barge, bring it around on the land to the other side of the bridge and then put it back on the barge, and then go down until they get to the next bridge. A couple of the last chief executives for the company have, when they resigned, has complained about the huge inefficiencies there. But when you have government ownership of things, they do other things other than trying to produce the product at the best price. Jason Hartman: They have to dole out favors to certain groups that support them to their constituents, right? John R. Lott: Right. And we see that now with General Motors many times, whether it was gonna move its headquarters to Warren from Detroit, or the placement of certain plants that they might close down, or other types of decisions that they would be making, politics enter into that, makes them have higher costs than they would have otherwise. If you want to go and do social policy, have everybody pay for it. But what happens is so much as the government decides we’ll get it for cheap by making businesses pay for this. And when they own it, it becomes very hard to see all the types of social policy things they’re doing. A lot of the current economic problems that we have are due to the government trying to make firms pay for their large debt. So, for the mortgage regulations that we’ve had where banks were forced against their will to make loans to customers who they didn’t think could pay them back. Jason Hartman: The community reinvestment act is what you’re talking about. John R. Lott: It would be one example and then there are other things that the federal reserve did during the 90s and you had Fannie and Freddie which would essentially force banks to take loans where there was 0 down or the Federal Reserve would say you could be charged with discrimination if you ended up not including welfare payments or unemployment insurance as income for individuals. A normal lender would say if you’re getting welfare now, and there’s a limit to how long you’re going to get that, I don’t know your ability to go and pay off in the future. The government said banks have to count that. And it’s not like banks just had something against people who were on unemployment insurance. They’re taking a risk. They want to make sure that they can get the money back. You put things in there where you don’t require a down payment, that’s fine as long as prices go up in housing. But as soon as they start to go down, you have a lot of people who will just walk away from their houses at that point because they have no reason to stay there. The amount they owe is greater than the value of the house. The government officials say we have the social policy. We want a lot of the people who can’t afford to buy homes to buy them. We’ll just make the companies have to pay for it. And they don’t think about the long term consequences of making other people pay for the benefits that they want to take credit for going and giving out. It’s something that we see all too frequently with the government. Jason Hartman: One of the things that you didn’t mention yet that I think you’re fully aware of and will agree with, that it’s very hard to count what is never there. And I’ll give you an example. I took a visit to Moscow and we went out into the countryside and went to Star City and that is sort of their Houston, ahead of their space program or Cape Canaveral equivalent. It’s like their NASA. And we saw where they trained the cosmonauts, the Soviet astronauts, where they ran their space program. And, I’ll tell you, John, it was mindboggling in how primitive it was. It was so amazingly primitive, I just couldn’t believe it, and the people I was with couldn’t believe it either. And all the innovations that never occur under this government as nirvana type of life, this socialist type of world, those can’t be counted, but their cost is incredible. John R. Lott: We see this type of opportunity cost all the time. You look at the stimulus package that we were talking about earlier. We see the jobs that are created. We don’t see the jobs that are lost because the government’s taking money from that part of the economy to give to something else. When the Obama administration, when they want to count jobs created, they just say, well, we paid so much money and we can see that these government agencies hired so many more teachers or whatever it is that’s there, and so we’ll count those as jobs created, but the real question is what’s the net number of jobs, not that you can grow the government side and make the private sector shrink. I mean everybody understands that or I hope they do, but it’s something that’s completely left out of these types of discussions. There’s so many times where you see this with regulations. One thing you see over time is accidental deaths of all types fall over time. And one of the simplest things that’s done is people say “Well, look, we passed the safety regulation and, look, the number of deaths for these types of accidents have declined. The thing is it would have fallen anyway. I mean, you go back to 1900, a little bit after when we started collecting accidental death rates by type of accident and everything’s falling over time. You’re going to always get a lower average after any point and time you would have picked there. And just to pass a law and say that therefore all those lives saved are due to the regulation is often not the case. In fact, sometimes these types of rules actually have perverse impacts. It’s just we don’t think about what the alternative would have been even without these types of rules. People, if they get wealthier, value safety. Companies like producing safer products. They would have produced them anyway in many of these cases. Jason Hartman: Unequivocal of course. Let’s just finish up with voting rights and voting wrongs. John R. Lott: Sure. Research on a couple of different issues here, one puzzle, well it’s a lot of academics for literally decades, has been why governments around the world started to grow when they did. It’s basically about a 50 year period of time from around 1900 to about 1950 where country after country in the world would have been the same size for literally hundreds of years as a percentage of GDP the government’s spending, all of a sudden would start to shoot up. So, for example, in the United States, our government spending as a percentage of GDP was from the beginning of the republic up until near about World War I was about 2 to 3 percent of GDP, go up during the war, go up above that, but then after the war was over it’d come right back down. After World War I, it didn’t go back down to where it was before. It just started growing. Basically, a lot of people think that the federal government started growing in the 1930s. It actually started to grow at about the same rate during the 1920s. But it wasn’t just the United States. Different countries in different years during that period of time would start to grow. And so one of the things I just noticed, kind of accidentally one time, was that the timing for when these countries started to grow just happened to correspond to when women were given the right to vote in different countries. And the nice thing about the United States is that, with the different states, some states gave women the right to vote prior to the 19th Amendment in 1920. And you could see that as soon as women were given the right to vote in these different states, the government spending would start to go up. Real per capita government spending and taxes were more than double in a state in the 10 years after women were given the right to vote. And it would keep on going up and move very proportionately with the percentage of women who voted. When you gave women the right to vote, not all of them voted right away. Jason Hartman: So, I’m dying to know what your theory is about that. John R. Lott: Just one other piece of evidence I’ll just point out first, and that is there are two types of states. You have those states that voluntarily gave women the right to vote women the right to vote and those that were forced to do it. And the really neat thing about the US is that the possibilities, there’s just something else that’s going on that you’re liberal, you give women the right to vote, and you want larger government, or the fact that you gave women the right to vote that caused a bigger…Just the women being given the right to vote, you should see an increase in government spending in both the states that voluntarily gave women the right to vote and those that were forced to do it. And that’s what you find. In fact, it’s a very similar pattern. And you can explain a lot of the growth in government for about the next 60 years almost, 55 years, because it takes about that long before women end up voting at the same rate as men do. As women make up a greater percentage of the voting population, you can see increased growth. Now, basically what’s happening is I think women basically rely on government more for protection. And you can see this over a woman’s lifetime. Women start out being much more liberal than men, young women more liberal. Jason Hartman: No question about it. John R. Lott: About half of the gap between men and women disappears. When they get married and have kids, about half that are remaining or about 75% of the original difference disappears. But when women with kids get divorced, they become much more liberal than they were to begin with. And that’s whether they support more progressive income taxes or more social programs, whatever, really changes a lot over that time. So it’s kind of like when women are married to men who are more likely to be hit by the higher marginal income tax rates, they’re against higher marginal income tax rates. But when they’re on their own and particularly having to take care of kids, their incomes don’t vary as much as men’s. They tend to be lower. They become much more in favor of progressive income taxes. So I think that’s part of it. What basically happens, you can explain the growth in government until you get to the 1960s with just a greater percentage of women voting, and then what happens is the big increase in divorces. Jason Hartman: Then it really becomes more liberal because you’ve got a lot more single moms. John R. Lott: With kids. Jason Hartman: Yeah, makes sense. Yeah. John R. Lott: And a lot of that I think is due to the changes that we’ve had in divorce laws when you’ve moved from at fault to no fault divorce. Because what used to happen when you had ad fault divorce is that if a guy wanted to go and marry a secretary, he essentially had to get the approval of his wife to go and have the divorce. He couldn’t just say I want a divorce. And the wife then could say, well, I’ve made all this investment in the home, I’ve stayed home, I haven’t had a career. You’re gonna have to pay me a lot to let me you out of the marriage. Now what’s happened when you’ve had no fault, he no longer has to get the approval of the wife for the divorce. What happens is he can just decide to leave rather than him having to essentially pay her off to be granted divorce, she almost has to pay him to stay in the marriage. So women, when they would make much bigger investments in the home and the children staying at home, making sure the home runs properly, they have a big risk when you have no fault divorces because they can essentially be held up for all that investments. The man, he’s been investing his career and he can leave at that point. So what that did was, I think you also can explain to some extent, women moving more into the workforce and having fewer kids because it’s very costly to stay at home and raise lots of kids. And they risk by doing that now, being much more likely to be held up by the husband if the marriage were to break down. And the fact that women aren’t investing as much in the home and the husband isn’t either means that you are more likely to get higher divorce rates. I mean just take the simplest example of that. If you have 0 kids or you have 4 kids, where are you more likely to get a divorce? Temptations, financial problems, whatever arrives over time, if you have no kid, it’s much easier for you to go and leave the marriage than if you have this big investment in each other in terms of the number of kids that are there. So I think there’s just a lot of unintended consequences over time for these since it happened. But I’ll just give you one or two quick examples here that are shorter. The basic point that I try to make in the book is that how much the world you can explain with just the simple notion that if something’s more costly people will do less of it. It applies to crime. It applies to all sorts of voting things. One example with the voting is when you have the secret ballot. What do you think happened to the number of people voted when you move to a secret ballot? Jason Hartman: More people voted. John R. Lott: Fewer. You had about 10% drop in the rate at which people voted when you move to a secret ballot. Jason Hartman: Why would that be? I would think the opposite. John R. Lott: Well, one of the reasons why they moved to the secret ballot is because people were getting paid before to vote for certain ways. And if you don’t have a secret ballot, I can see how you’re voting and so I can pay you off. If it’s a secret ballot, just because you tell me you voted a certain way, I can’t be sure that you’re doing it and so I can’t pay you off. And so people were getting paid to vote in many cases, not every case but there was a substantial number, particularly in certain areas in the country, where they would get rounded up and paid, a lot of the Tammy Halls and other places to go and vote. And you would see, particularly in those places, but across the country as a whole, it dropped in voting as soon as the people who were paying them off couldn’t monitor how they were voting. Jason Hartman: So, John, this is a really interesting discussion. First of all, tell people where they can get the Freedomnomics book and help us wrap our head around the whole concept if you would. John R. Lott: Sure. Well, the book’s available in places like Amazon.com, probably some book stores that still have it, but the notion is that you can take this idea that if something’s more costly, you’ll do less of it. The greater return, you’ll do more of it. And you can explain all sorts of things, like why airline ticket prices vary on how close you are to when the flight’s gonna be taking off or the difference between full and self-service Vaseline varies by the grade that you’re going to be buying, or why you pay more for dinner than lunch at different restaurants. You can also use it to explain crime, just higher penalties, make it more costly for criminals to commit crime. Or you can make it more costly in many different ways from letting individuals defend themselves with a gun to having higher arrest rates by police. You can explain the rates at which people report things to the police. More important crimes that police are more likely to solve get reported much more frequently to police than crimes that aren’t as important, that they’re not gonna spend the time and resources to go and try to solve. The greater the return to reporting it, the more likely people are to report it to the police. And that changes over time in different ways. So there are lots of things that people look out there – voting fraud can be explained often by just changes in the costs of engaging in those types of activities. But it’s just this one notion I try to show can explain a lot of the world that we see around us. Jason Hartman: Yeah, well that’s a great point. Alright, John R. Lott, thank you so much for sharing the Freedomnomics concepts with us today. We really appreciated having you on the show. John R. Lott: Oh, no. Thank you very much.